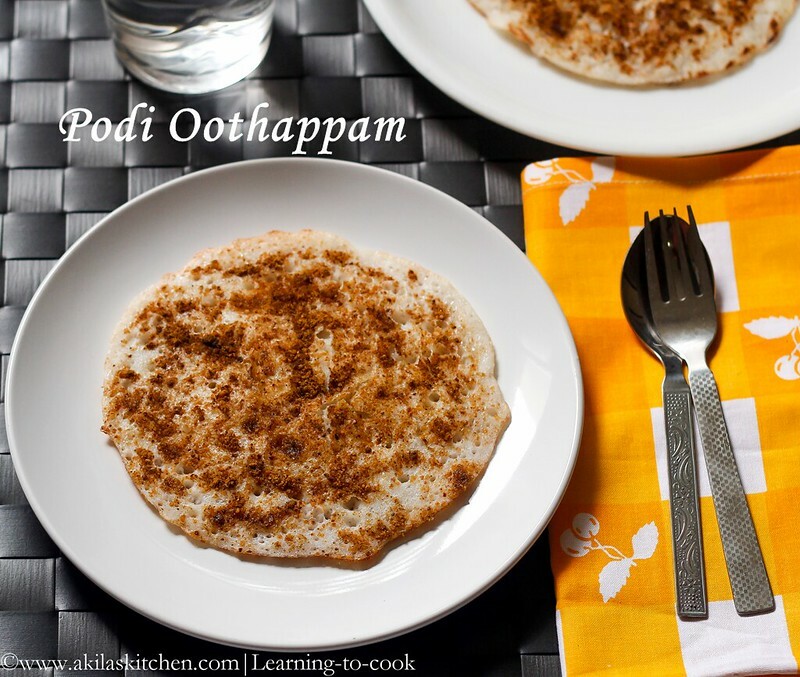 Podi Oothappam / Podi uthappam is one of the simple variety of oothappam which we can for a change. This oothappam I first had in vasantha bhavan in Tambaram and liked it. After that I completely forgot that. Two weeks back, when I checked my Idli milagai podi, I found its crispiness has gone and when I was thinking what to do with the old podi, got the idea of making the podi oothappam and it turned out pretty good. 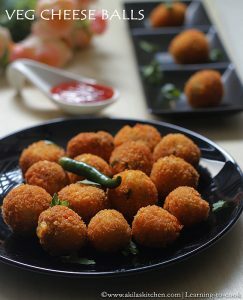 So here is the very simple recipe of Podi Oothappam. 1. Heat the dosa pan / dosai kal in medium flame. 2. Add 1/2 tsp oil and spread on pan. (You can skip this part, if you use non stick pan). 3. Now add 2 or 2 and 1/2 laddle full of the dosa batter on the tawa. 4. Sprinkle the Idli Milagai Podi generously on top. Add or sprikle a 1/2 tsp oil on the podi. 5. Close the oothappam using some lid. ( I used aappa kadai cover). Cook in medium flame for a 1 to 2 min. 6. Open the lid and check whether the oothappam is cooked. If not cooked, let it cook for another min. 7 . Serve it hot with your favorite sambar or chutney. You also have this as it is, as it already contains the idli milagai powder. 1. The Batter should be not be too thick or watery. Then oothappam would not come out nicely. Batter consistency plays an important role. 2. Do not flip the oothappam, as you do for the dosa or other oothappam, as the podi gets burnt sometimes and would not be nice. 3. 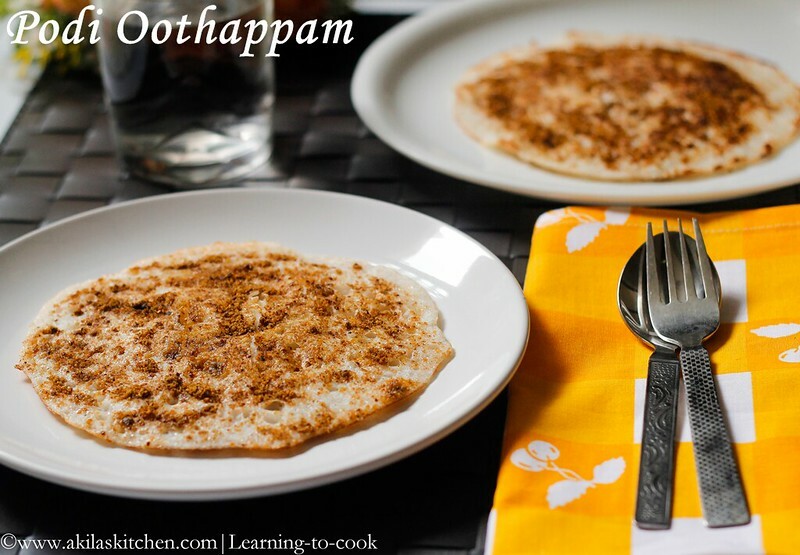 Covering the oothappam and cooking is my MIL’s method. You can try without covering with lid also. Love the spice spreaded dosa.do join my event below..looking for our delicious recipes…. Interesting n lovely pics Akila. My H love this podi dosa 🙂 looks so Delicious and very tempting one !! wonderful idea ! looks yummy ! 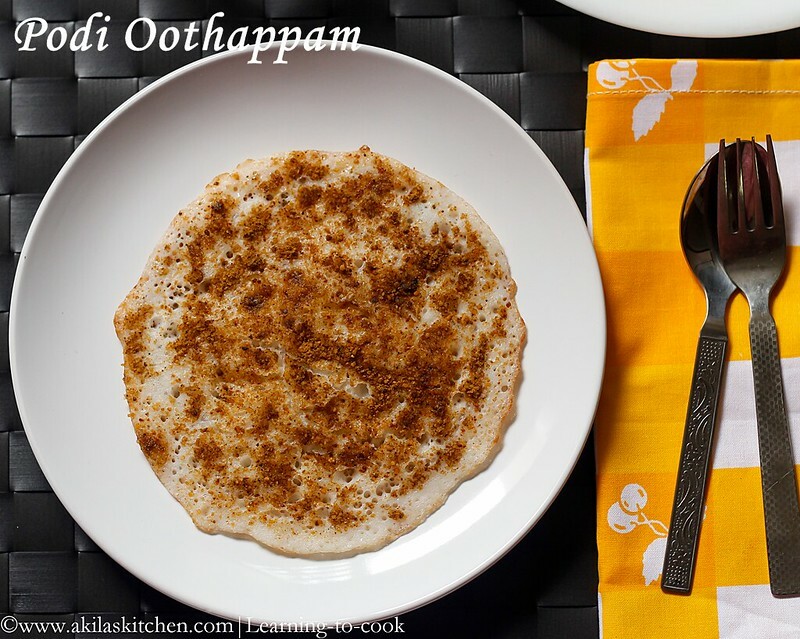 love this flavourful oothappam…looks delicious..
that's an interesting twist to normal oothappams…gud one, dear. Such an easy preparation and I am sure it tastes awesome. Would love to have one right now. This is my favourite too. You have made it perfectly. Uthapam does not really tempt me but I love the podi. I can eat it with rice and enjoy the taste all the way. That said, the podi is so perfect over the uthapam. 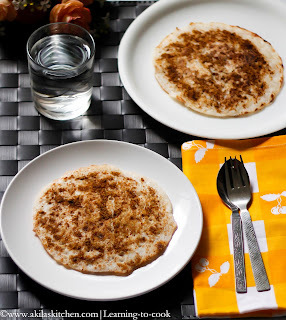 Easy to make and very flavorful uthapam too 🙂 Well explained! !